; $Copyright: Copyright 2016 Broadcom Corporation. ; ALL USE OF THE SOFTWARE. ; Broadcom integrated circuit products. ; OUT OF USE OR PERFORMANCE OF THE SOFTWARE. ; This is the LED program for the S9100 USa board. ; There is only one LED per four ports for combine status of link and activity. ; assumes link status is kept current in bit 0 of RAM byte (0xA0 + portnum). 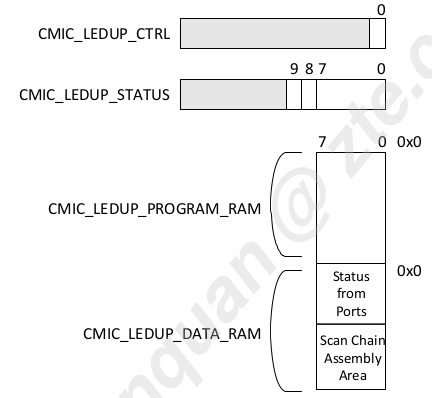 ; link status data thru' CMIC_LEDUP*_PORT_ORDER_REMAP_* registers. ;  This routine is called once per tick. ;  This routine calculates the link and activity LED for the current 4 ports. ;  and resets the timers). ;        and get_act() four times in the implemention of this routine. ;  This routine finds the link status for a port. ;  Outputs: Carry flag set if link is up, clear if link is down. ;  This routine finds the activity status for a port. ;  Outputs: Carry flag set if activity, clear if no activity. ; linkscan task. See $SDK/src/appl/diag/ledproc.c for examples. ; In this program, bit 0 is assumed to contain the link up/down status.